Kat and Karl : words of wisdom. Totally cute, but, Oh my god does it make me feel old because I remember when us girls used to go to this church to watch these guys play in the basketball games! It was meant to be, boys. You were born to coach! This post has brought a tear to my eye. 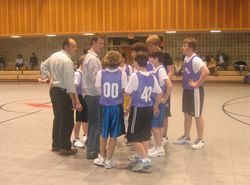 All the fond memories of St. James basketball. I still don't think Matt should be allowed to coach since he was an arch rival of St. James. were our guys really that small when we used to go watch them? that's crazy.